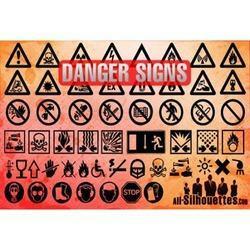 We are the leading manufacturer and trader of the Danger Sign. Danger Sign offered find extensive use in industries as well as other areas where there is possibility of causality occurrence. Featuring perfectly smooth finish, these signage choices reflect in them flawless finish standards and exclusive clearly depicted artwork which add to their visual presence and easy readability. Some of Danger Sign features include light weight, easy to install, waterproof, available in reflective film finish to allow clear seeing even from a distance, choice of various shapes like triangle, round, rectangle, octagonal and others.